By the end of 2010, the Government's objective of providing free nine-year education was achieved in all 2,856 counties. 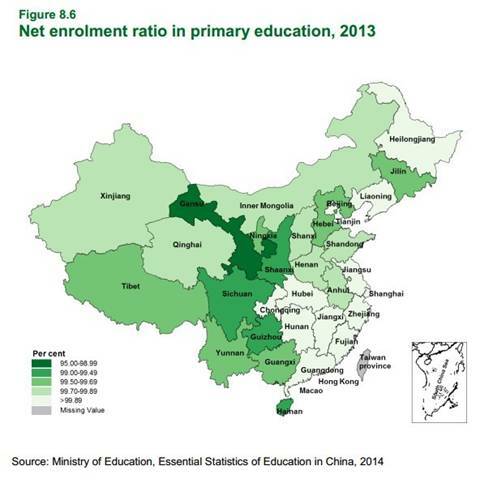 In 2012, China met its national target of allocating 4% of its GDP to education, but funds for improving education quality are still inadequate. The bulk of funding goes into infrastructure, teachers' salaries and textbooks; while teacher training, curriculum reform and monitoring and evaluation remain under-funded. The National Plan for Medium and Long-Term Education Reform and Development (2010–2020) set forth several targets for pre-primary education, including attainment of a 70% gross enrolment ratio for three-years of pre-primary education by 2020. Since 2011, local governments have been gradually implementing three-year action plans and commensurate budget allocations to build and improve pre-primary education. In addition to children of migrant workers receiving access to nine-year basic education, the National Plan for Medium and Long-Term Education Reform and Development (2010–2020) also requires the governments of the receiving cities to bear the main responsibility by accommodating them in public schools. However, many children of migrants are unable to attend local public schools due to other costs and enroll in private and often low-quality schools. High fees, as well as the entry of older migrant children into the labour market, result in higher dropout rates among migrant children than among urban resident children. Part of the School Merger Programme addresses the education and care of children left behind by migrant parents also, but management and supervision in boarding facilities remain a concern. The Government has allowed for the abolition of tuition fees, and the policy of "Two Exemptions and One Subsidy" (exemption of textbook fees, exemption of miscellaneous fees and increased subsidy for rural boarding school students), benefiting 160 million students since then. School infrastructure and facilities in rural areas have also improved through the construction of junior secondary schools with quality dormitory facilities and provision of distance education facilities. The relationship, however, is not linear. 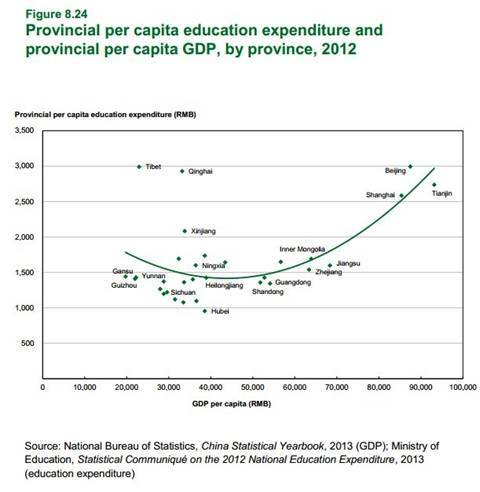 Some western provinces with a low GDP per capita may have similar levels of per capita expenditure on education as some eastern provinces.